We’ve been busy during the first quarter of 2014. We published three new resources for Native American communities, plus we announced the 2014 calendar of our highly popular “First Nations Knowledge” webinar series. After months of research, writing, editing and designing the publication, we just published “The Business of Indian Agriculture,” a comprehensive curriculum for Native American farmers, ranchers and other agricultural producers that can be downloaded for free from the First Nations website. It is designed to be used by tribal college instructors, extension agents or workshop instructors. It includes both a 562-page Instructor Guide and a 323-page Participant Workbook. The curriculum is designed to help farmers, ranchers and agricultural producers succeed in managing their businesses. It covers useful topics like how to develop a business plan, how to set up bookkeeping systems, and marketing. It also covers important topics like risk management, personal financial management, and using credit wisely. The project was supported by the USDA-NIFA Beginning Farmer and Rancher Program, the W.K. Kellogg Foundation and the CHS Foundation. Development of the curriculum was made possible through a partnership between First Nations and the First Americans Land-Grant Consortium (FALCON), which is a nonprofit professional association of administrators, faculty and staff of land-grant tribal colleges and universities. FALCON is sanctioned by the American Indian Higher Education Consortium (AIHEC). John Phillips, who is executive director of FALCON, was the primary author. Phillips is also the land-grant program director for AIHEC. The curriculum is offered free to anyone. It can be viewed as an online “flipbook” or it can be downloaded as PDFs. Interested parties can also request a Word version of the materials to use and/or adapt for their own classes or other uses. 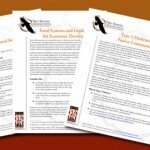 To access the materials, please go to this link: www.firstnations.org/knowledge-center/foods-health/biz_of_indian_ag. We also published a new series of 12 fact sheets concerning Native American health and food issues. You can read them or download them (as PDFs) from our website. They are absolutely free, but you may have to create a free account in our Knowledge Center (our online resource center) in order to access them. If you already have a free account in our Knowledge Center, you can get right to them after you sign in. These Fact Sheets were created as part of our Native Agriculture and Food Systems Initiative (NAFSI), and were generously underwritten by the W.K. Kellogg Foundation. We also published a 78-page report titled “American Indian Leadership: Strengthening Native Communities and Organizations.” It is available for free on our Knowledge Center at this link: http://firstnations.org/knowledge-center/strengthening-nonprofits. The report gives an historical perspective of Native American leadership styles, including what led to the development of tribal governments and Indian-led organizations today, and it looks at the state of existing Native leadership programs across the U.S. The publication was underwritten by Northwest Area Foundation. Here’s the link again. Then select “American Indian Leadership: Strengthening Native Communities and Organizations.” http://firstnations.org/knowledge-center/strengthening-nonprofits. For the second year in a row, we announced we will host a series of free webinars called “First Nations Knowledge” during 2014. This year’s series focuses on food safety, and will provide specialized and technical webinars to develop the capacity of tribes, Native businesses, farmers, ranchers and other individuals involved in growing, processing, packaging and/or marketing food products. We will present the webinars in partnership with the Indigenous Food and Agriculture Initiative at the University of Arkansas School of Law in Fayetteville. Each webinar will last 1-1/2 hours, with the first hour for presentations followed by a half-hour of questions and answers. The first of this year’s nine-part series was held on March 20. It was the first of two webinars on biological, chemical, radiological and physical hazards. The second part will be scheduled for April. Over the webinar series, presenters from the University of Arkansas will include Steven C. Seideman, Ph.D., who is extension food processing specialist at the Institute of Food Science & Engineering; Janie Simms Hipp, J.D., LL.M. (Agricultural Law) (Chickasaw), who serves as founding director of the Indigenous Food and Agriculture Initiative; and John Marcy, Ph.D., a food microbiologist with more than 35 years associated with the meat and poultry industries. The planned remaining schedule for this year is as follows. Dates will be formalized on a monthly basis, and scheduling or topics may change depending on availability of expert presenters. To receive information about each webinar as it is scheduled, follow First Nations on Facebook and Twitter or sign up to receive informational emails from First Nations at this link. You can also check on the First Nations Knowledge webpage at this link: http://firstnations.org/programs/foods-health?qt-native_american_foods_health=7#qt-native_american_foods_health.